The French Open (also known as the Roland-Garros) is one of the biggest annual events within Tennis. It is the only major tournament to be played on a clay court. In recent years, the tournament has witnessed some of the most exciting matches of all-time between legendary players such as Rafael Nadal, Roger Federer and Novak Djokovic. 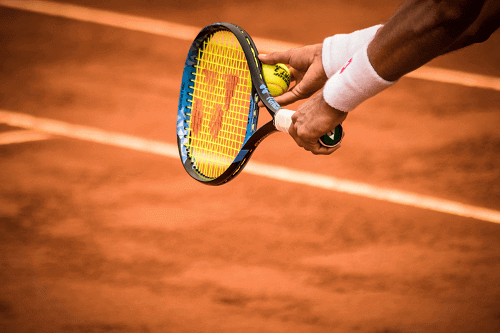 With the French Open being one of the most exciting tournaments in all of tennis, it makes sense that some avid tennis fans would be keen to bet on games to amplify the thrilling game. On this page, we look at the bets and odds players will encounter when betting on the French Open. As the name may already imply, in head-to-head bets, bettors attempt to predict the winner of a particular match-up. When making such bets on any sort of tennis tournament, it is important to research all sorts of factors that may impact the result of the match and thus your bet. For example, in the French Open, aces are less likely to occur. Thus, it is important for bettors to focus on the fitness of players instead. Some betting sites allow bettors to place wagers on stats like the number of aces in a match, etc. Live betting is a staple at tennis betting websites and can be lucrative if you know what to focus on. There are many situations where the favourite to win a particular match suffers a bad start and then comes back. We recommend trying to find a match featuring a favourite is struggling and placing a bet when odds are high. Should the favourite come back to win (which has often been the case), you’ll be in for a big payout. The winner of the French Open usually isn’t ranked world number one. Often, bookies will peg many other lower-ranked players to win the tournament due to its rather unpredictable nature. In recent years, the best bet has probably been just to bet on Rafael Nadal, who has won the tournament 11 times in the last 13 years. Further cementing this idea to have a look at other players rather than the world number one, is the fact that the tournament winner has only been the number one seed going into the tournament twice in the last two decades. Looking at the results of other European tournaments, such as the Madrid Open or the Italian Although these tournaments may not be as popular as the Australian Open or Wimbledon, both are also played on clay, and are more representative of what the French Open conclusion will look like. For example, in 2018, Rafael Nadal won the Monte Carlo Masters and the Italian Open, before going on to win the French Open. With regards to the French Open Women’s Singles tournament, predicting a winner is slightly more volatile than with the men’s tournament. This is particularly true as the tournament has seen so many different winners in the last twenty odd years. Ultimately, when betting here, we recommend trying to analyse the form of best players going into the game. The French Open is one of the most exciting tennis tournaments due to its unpredictable nature towards the final. Sports bookies have a host of bets for American bettors who may be interested in betting on the tournament. We recommend having a look at some of the sports books we have listed above for the best odds.